Battle Type Evolution Requirements Unless this Digimon is replaced with another Level III Digimon, it cannot be sent to the Dark Area. 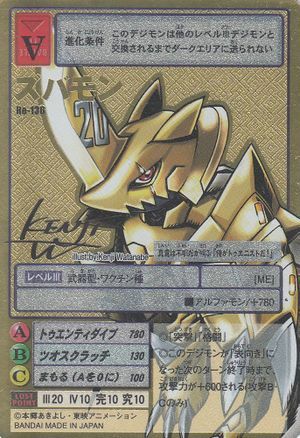 ■ Add 780 to the attack power of your Alphamon. ◎Has the abilities "charge" and "grappling". ◎Until the end of the turn after the turn during which this Digimon turned face-up, add 600 to its B and C attack powers only. This page was last modified on 2 December 2017, at 06:12.